Authorities in Bermuda have found the body of a St. Joseph's University student who went missing over the weekend. 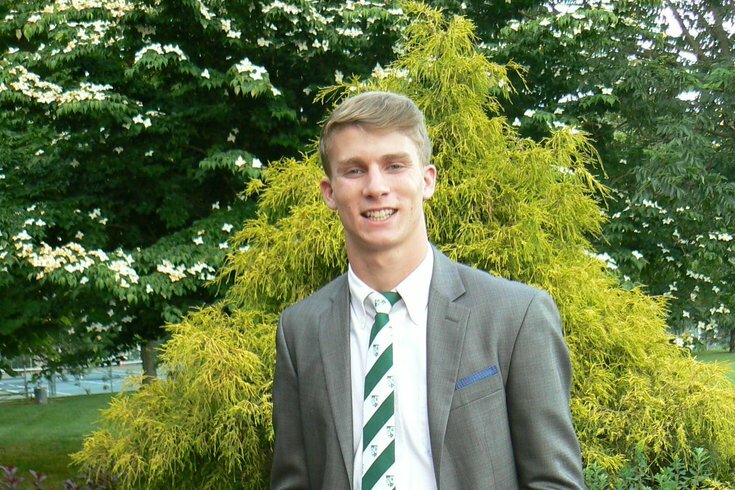 Mark Dombroski, 19, of Pennsylvania, was discovered Monday afternoon after disappearing from a bar during a tour with the college rugby team, according to the Associated Press. Dombroski, a freshman had been scheduled to leave Bermuda on Sunday with the rest of the St. Joe's team. He was last seen just after 12 a.m. Sunday at a bar called The Dog House. Police had released four photos of Dombroski and asked for assistance in tracking him down. A marine unit spent the day searching for the teen with help from his family, local authorities and volunteers. There were no immediate details provided about how Dombroski may have died, but officials said earlier Monday there were no signs he had been drunk or that alcohol played a role in his death. 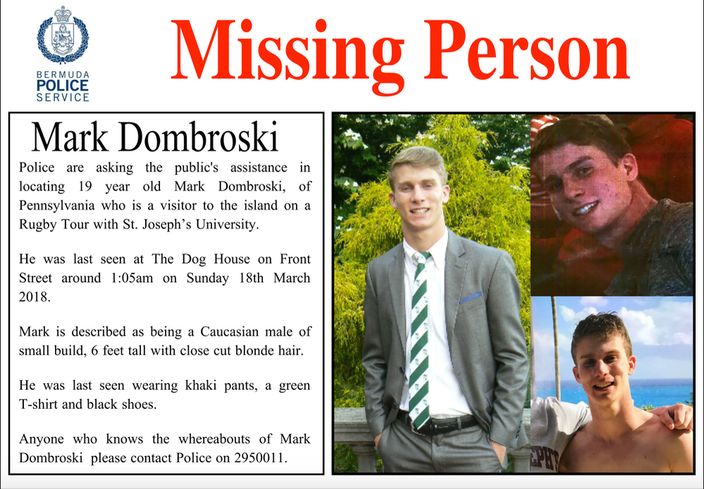 A missing persons poster for 19-year-old St. Joe's student Mark Dombroski, who was last seen at a Bermuda bar in the early morning hours of Sunday, March 18. According to an article in the Delco Times, Dombroski is from Upper Providence, Delaware County, and attended Archmere Academy, a private Catholic prep school in Claymont, Delaware. In a tweet from the official St. Joe's account, school administrators said their "hearts and prayers" are with Dombroski's family and that they are hoping for his safe return. The tweet also said the school will provide more information when it becomes available. Our hearts and prayers are with Mark Dombroski and his family. We hope for his safe return, and we offer our support to the Saint Joseph's community. We will update when new information becomes available. Police are asking anyone who has "witnessed these incidents" or has information on Dombroski's death to call their respective police station or the Crimestoppers Hotline at 1-800-623-8477. Authorities did not specify what "incidents" someone may have seen in relation to Dombroski's disappearance.